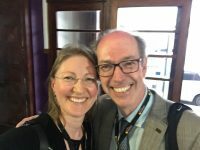 My visit to ESTA Malta 2018 was pleasant but a little bit too short. Registration 10th April 2018 between 3.00 – 4.30 p.m.
After short registration Albert Garzia / Antoine Frendo gave us a quick sight “A look at what was possibly Charles Camillieri`s last work”. Garzia himself is Maltese composer (b. 1977) and had started his musical training as an accordionist. He has also completed his undergraduate studies in Music Composition at University of Malta and his Masters degree at Royal Northern College of Music in Manchester. Frendo (M. Phil Music) studied violin under Carlo Fiamingo and he was the former leader of the Royal Malta Opera House. He retired from University of Malta in 1997 and from Malta School of Music in 2006. In the year 2000 he started the Malta branch of the ESTA. 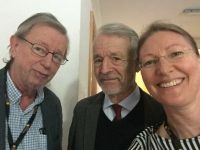 Svetlana Danneberg came to Malta in the late summer 1974 with a team of three experts sent by “Institut für Internationale Zusammenarbeit” which was a set up a Music School, the first of its kind in Malta. Project was sponsored by the Austrian Government. Danneberg studied violin with Robert Peinemann and did her final degree in music education at the Hochschule für Music in Berlin. The school was named by Johann Strauss school of music. Everybody in Malta new him because the New Years Strauss concert was famous concert to be seen from television every year. Maltese were also very keen to opera. Opera house had a long shiny history before WW II, when it was ruined almost totally. 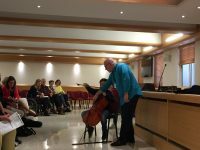 Alcantara, a cellist himself, had relaxed attitude to present to ESTA colleagues and some students how to let go of tensions in the bowing fingers, wrist, arm and shoulder. 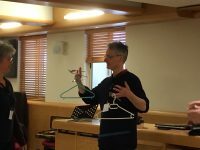 To me it was a little confusing, because to my opinion a student or colleague needs to be relaxed with the whole body first, stand properly and breath calmly before to start to carry spoons or coat hangers. Personally I liked a lot of “hello, hello, hello G Major exercise which we all, teachers and students, had a chance to take a part. Pedro de Alcantara is a musician, writer and teacher based in Paris. 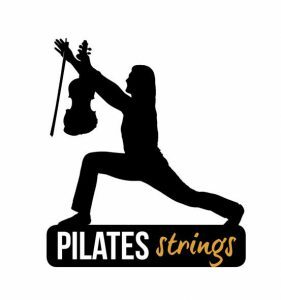 His newest book is The Integrated String Player, which offers practical tools for improving co-ordination, technique, daily practice, interpretation and concert preparation with dozens of exercises demonstrated in 80 video clips. 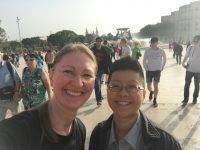 ESTA colleague from Germany gave helping hands..
President meeting in Valletta 11th April 2018, 9.00 – 11.30 a.m. It is always a pleasure to meet ESTA Presidents live. 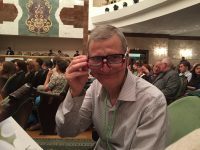 ESTA board President Bruno Giuranna could not arrive this time to Malta, but he sent greetings while being in Chamber festival in Florida. ESTA board vice President Mark Lambrecht read us Giuranna´s warm hearted greetings. 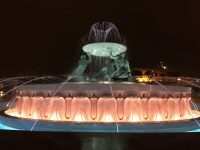 It was also nice to hear news and greetings from France, Switzerland, Germany, Estonia, Sweden, Norway, Portugal, Austria, Italy, Belgium, Holland, Denmark, Slovenia, UK. My greetings were mainly positive from Finland. We have activated, renewed our website and our SJO/ ESTA logo. New magazine is now on paper and on our website. Some ESTA colleagues would like to read our magazine in english, I heard. 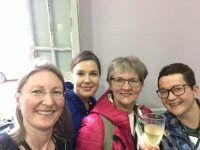 We had such a lovely weekend recently in Sibelius Academy from 7th April- to 8th April, 2018. 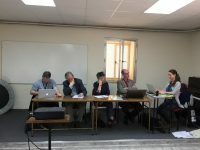 We have managed to have some more members (111) and ESTA is coming to Helsinki 2021. This process has already started and we in Finland hope that we have a chance to co-operate with Sibelius Academy and R House in the heart of Helsinki. ESTA Helsinki 2021 will be arranged from August 4th to August 7th. We will welcome exhibitors from August 5th to August 7th. 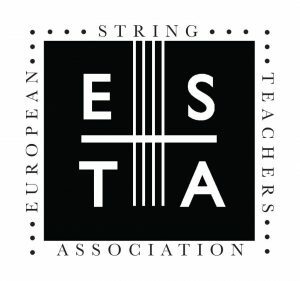 Next ESTA Cremona 2019 is going to be between April 26th to May the 1st. I also met Géza Szilvay in Malta. 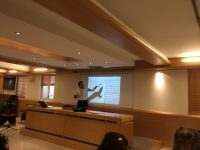 His topic was “Introducing the Kodály Philosophy based on Colourstrings teaching method”, which is very familiar to me and to our Finnish ESTA members. It is always wonderful to meet Géza and see his inthusiasm on this topic. 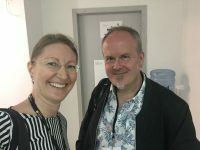 I discussed with Steve Bingham (ESTA UK), who held a concert on Lines and loops, the same we had heard already in ESTA Oxford 2013. 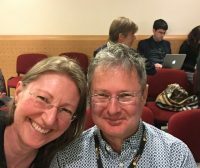 Steve is co-founder of the classical practice tool PartPlay part play.co.uk an is also Editor for ESTA UK. 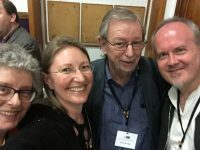 It was very pleasant to meet exhibitors so close from d`Addario (Lyris Hung from New York), Thomastic (Stojan Jovanovic from Vienna), C. Harvey Publications (Cassia Harvey from Philadelphia, USA) and Violin Friends (Lauri Hämäläinen from Finland). Hope to meet you all in ESTA Helsinki 2021! I thank you ESTA Malta 2018! My short trip to see all these marvelous colleagues and exhibitors was really worth of every minute! See you all in Italy, ESTA Cremona 2019! 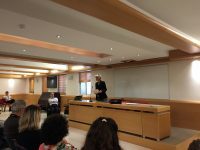 Dear fellow members of ESTA – being in Malta, I thought it might interesting for you to hear something about music education in Malta. I was once involved in setting up a School of Music in Valletta. That was in the years 1974 – 1977, which is a long time ago, but the School still exists and has been part of the cultural life in Malta for more than four decades now. So this is not a lecture, it is a piece of Maltese history. This was the first time that the state was interested in opening a music school. Prior to that, one notes a school run over a number of years which the composer Paolino Vassallo established on his return from Paris. It disappeared somewhere before 1910. A school projected by the Royal Opera House never really took off. The School of Music was started as a developement aid project sponsored by the Austrian Government. In 1973 the two socialist leaders of Austria and Malta, Chancellor Bruno Kreisky and Prime Minister Dom Mintoff, hat met in Helsinki on the occasion of the Conference on Security and Cooperation. There it was agreed that Austria would foster a cultural project in Malta, and this was supposed to be a music school. 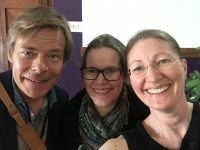 The team for the School consisted of three musicians: there was Verena Maschat, from the Mozarteum in Salzburg, designated as principal of the School, her brother, Alexander Maschat, and I. Together, the three of us covered the fields of pre-school music education, wind and string instruments plus voice and conducting. We were all young and full of enthusiasm. We arrived in the late summer of 1974. 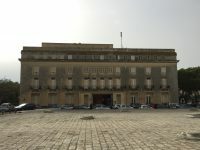 The location of the School was to be one of the old palaces in Valletta, which was being renovated in order to be able to function for its purpose. Things like sound proof tiles had to be installed, etc. Finally, on the 10th of April, 1975 – so that is exactly 43 years ago today, there was the official opening of the school. Along with the officers from the Ministry of Culture and Education came the Archbishop of Malta, and as the group entered the building from the front entrance, the workmen quickly gathered their tools and scrambled out at the back entrance, they had finished their work just on time. So, after we had the premises and a proper name, we could begin with our job. The first step was to send out a call for applications. The response was immense. Everybody wanted to come to the new SOM. There were more than 1000 applicants, children and grown ups of all ages, who wanted to become part of the school. We spent three weeks auditioning from morning till night. The amount of talent which was presented to us was incredible. You must know that Malta has a long history of musical culture, especially in the field of Opera. The Opera House in Valletta, before it was destroyed on the very last day of WWII, had been one of the great Opera Houses in Europe, with world famous artists coming to perform. Also the Manoel Theater in Valletta, one of the oldest baroque theaters in Europe, hosts orchestras, soloists and chamber music groups from all over the world. Music is brought to children by teaching them to play in the local bands. Every town and every village has its own band. These bands are very active, especially in the context of the numerous religious feasts or festas, as they are called here, and they form an important part of Maltese tradition and culture. And of course there are the numerous church choirs, which account for the developement of many vocal talents. Apart from that there is a wide net of private instrumental teachers, especially for piano. Maltese music teachers stood at our side and helped us form an excellent staff, so that the school could offer lessons for every instrument. For voice there was Antoinette Miggiani, a marvellous singer, who had sung at La Scala and at the Met, who took over the singing department. Some teachers were members of the Malta National Orchestra, some were involved in giving lessons to band members, and some were music lovers but actually chemistry teachers, like Antoine Frendo, who then became a full time teacher at the school. You all know Antoine and how dedicated he is to music and to teaching. In the course of his career, he has visited numerous master classes and has accumulated an immense knowledge regarding the technique of violin playing and interpretation of music, which he passes on to his students to this day. My other colleage for violin teaching was Mario Bisazza, who established his reputation with a performance of the Bruch violin concerto. I will never forget the first lesson I had with him and I must tell you this anecdote: Mario brought up his wrist very high when approaching the nut, and I explained to him that the wrist should be more flat and the fingers not stretched but very round. One week later Mario came for his lesson and had a perfect bow hand and a perfect change of bow at the nut. I said: how did you manage to change your position so quickly? Mario said, well, I strapped a cooking spoon to my forearm to make it straight, and then I practiced. 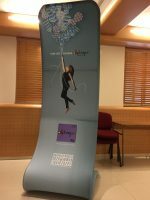 Austria was sponsering this project. It was not only paying our salaries, it also furnished the school with 2 Bösendorfer grand pianos, 3 Bösendorfer upright pianos, several wind instruments, violins and other string instruments of all sizes, a set of Carl Orff instruments, and a workshop with tools, so that minor repairs could be done on the instruments. We set up a library containing basic literature for all instruments, including chamber music. Young music teachers were given scholarships to study in Salzburg at the Mozarteum, so that they could be integrated into the staff of the music school on their return to Malta. We organized international summer courses when the school wasofficially closed. There was the section for pre-school musical education, where children were taught in groups, mainly on the Orff instruments. We offered individual instrumental tuition for all age groups and all levels. Traditionally Maltese music teachers teach their instruments according to the syllabus given out by the Royal Academy of Music in London. We had full time students, whom we prepared to become professional musicians with theory classes, analysis of music, ear training, composition, etc. in addition to their instrumental tuition. Joe Vella, a most prominent and internationally well known composer, took on most of these extra classes. the school also functioned as a vocational school, open to the general public. The three of us took turns in giving lectures on topics of general musical interest, and as word got around, more and more people came to our lectures. Eventually the school was buzzing. It was full of life, fun, enthusiasm, laughter and energy. We introduced chamber music classes for our students, had regular students concerts, and a school orchestra was formed. Besides doing the classical symphonic repertoire, the orchestra once did a real Viennese opera ball (at the Casino Maltese, where we shall have the Gala Dinner) with debutant dancers, with the music of Johann Strauß. The orchestra performed in many locations all over the island: in the Manoel Theatre and in St. John’s Cathedral in Valletta, in front of the Presidential Palace in St. Anton Gardens, in Mdina in the center of the island, and in the Hall of the University. The School of Music became known to everyone and became an important factor in the cultural life of Malta. And soon there were full-time students of music being enrolled. This was a time when there was no music department or institute at the University of Malta and the National Orchestra (known as the Manoel Theatre Orchestra) was a very small one. After three years had passed, our team decided that the school was now able to stand on its own feet and did not need us any more. It was time for us to go back to the European continent and pick up our lives where we had left off. The three years we had spent in Malta had been full of wonderful experiences. The friendliness and hospitality that the Maltese people had shown towards us was overwhelming, and that is the reason that to this day I always come back to the island. I try to keep in touch, especially in the context of ESTA. For me, the greatest gift was the trust and the faith which was brought forward to me by my Maltese students. It was a great responsibility and a great joy. History does not stop here. In the years after our team left the island, it was not always easy for our Maltese colleages to continue their work along the lines we had established. They went through some rough times, politics were not always supportive of their work. Before our team left the island, we had tried to ensure that a competent musician would take over the leadership of the school. Unfortunately this was not the case. A person, who had no musical background, but was close friends with the Prime Minister and member of the Socialist Party, was given the position of principal of the school. The first thing this person did was to shut down the library, collect all the instruments on loan and shut them away, and demand group tuition. This was a very bitter lesson in politics for all of us. But in spite of these difficulties, our colleagues carried on and did not allow themselves to be discouraged, all for the love of music. After a period of ten years, things improved, and the school was then given into competent hands, and now, after 43 years, it is still thriving and contributing to music education in Malta. People have asked me why I am a member of ESTA Malta, although I am German. Now you know the reason, I thought I might tell you. Thank you for listening.